VERY PRETTY EISENBERG ICE SNOWFLAKE PIN! IT’S SILVER-TONE, MEASURES 1 3/4" DIAMETER, AND IS MARKED EISENBERG ICE. 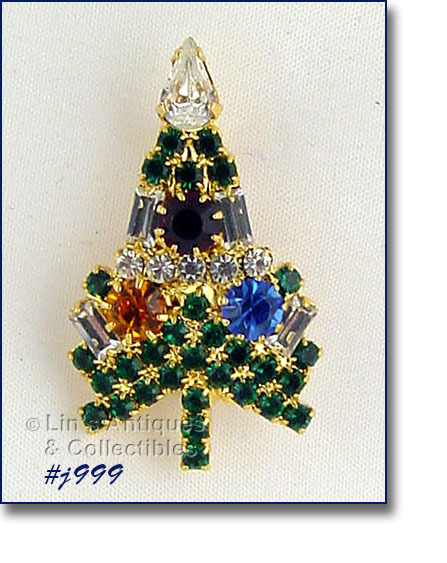 THIS EISENBERG ICE CHRISTMAS TREE PIN IS NOT RHINESTONE “FLASHY” BUT HAS LOTS OF DETAIL! IT IS GOLD-TONE WITH GREEN BOUGHS. 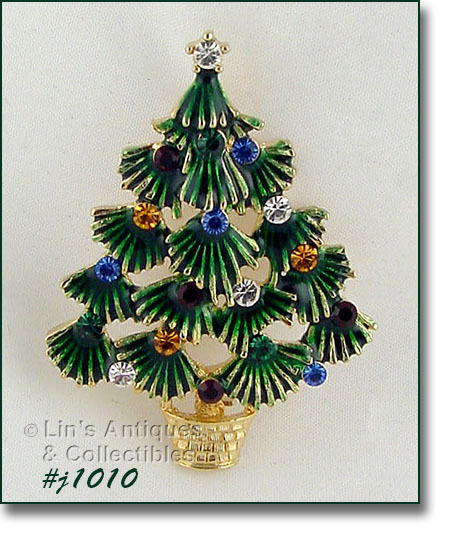 THE TREE HAS MULTI-COLOR RHINESTONE “DECORATIONS”, MEASURES 2 1/8” X 1 5/8”, AND IS MARKED EISENBERG ICE. 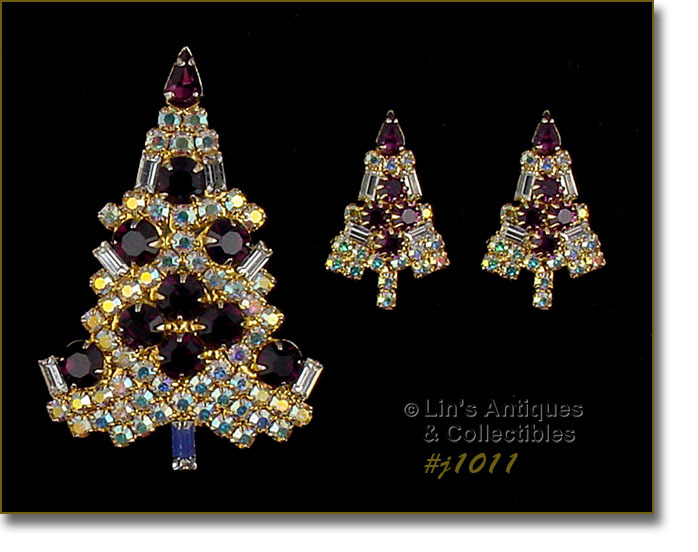 THIS IS ONE OF EISENBERG’S MORE UNUSUAL CHRISTMAS TREE PINS – IT DOESN’T HAVE RHINESTONES! PIN IS GOLD-TONE AND HAS ENAMEL BEADS PLACED AS “DECORATIONS”. IT MEASURES 1 3/4" X 1 1/2" AND IS MARKED EISENBERG ICE. I HAVE AN IDENTICAL PIN IN MY COLLECTION AND IT WAS ONE OF THE VERY FIRST EISENBERG ICE PINS THAT I PURCHASED. 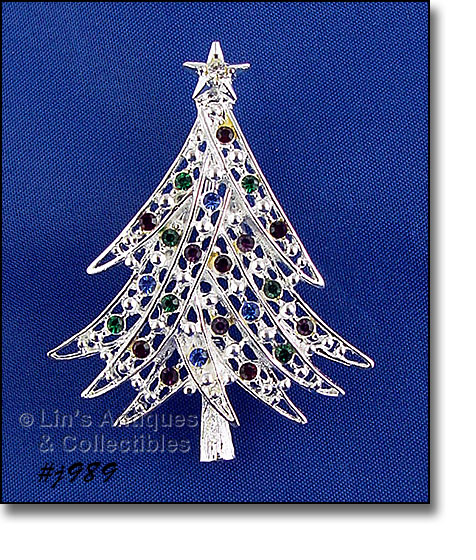 I LIKED IT BECAUSE OF ITS SIZE AND ITS SIMPLICITY – IT’S NOT RHINESTONE FLASHY – IT IS STILL ONE OF MY FAVORITE EISENBERG ICE CHRISTMAS TREE PINS! PIN IS COMPLETELY COVERED WITH PRONG-SET RHINESTONES. THEY ARE AURORA BOREALIS AND HAVE LARGE DARK BLUE RHINESTONES PLACED AS “DECORATIONS”. BACK IS MARKED EISENBERG ICE. 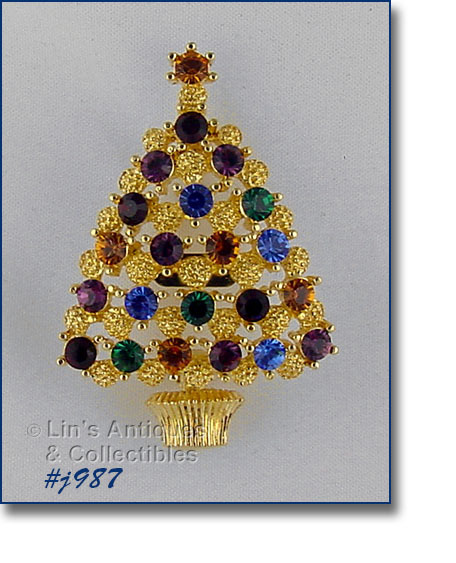 THIS EISENBERG ICE LISTING HAS A GOLD-TONE HOLLY CHRISTMAS TREE PIN! IT HAS MULTI-COLOR RHINESTONE “DECORATIONS”. THIS EISENBERG ICE CHRISTMAS PIN HAS SO MUCH DETAIL! THE RHINESTONES ARE DARK GREEN, BRIGHT RED, AND CLEAR AND ALL ARE PRONG-SET. THERE ARE 2 RHINESTONES ATTACHED AS “DOTS” OVER THE LETTER J AND THE LETTER I AND THERE ARE 3 TINY JINGLE BELLS ATTACHED TO THE BOTTOM OF THE PIN. PIN MEASURES 2” LONG (AT LONGEST), 1 ¼” WIDE (AT WIDEST). IT IS UNMARKED BUT IS STILL ON THE ORIGINAL EISENBERG ICE STORE DISPLAY/HANG CARD. THIS EISENBERG ICE PIN IS REALLY CUTE! IT’S SLEIGH SHAPED AND “FILLED” WITH A DECORATED TREE AND A WREATH. THIS ONE IS A LITTLE DIFFERENT THAN THE OTHER EISENBERG SLEIGH PINS WE HAVE LISTED – IT HAS A WHITE ENAMEL BOW ON THE WREATH (OUR OTHERS HAVE RED BOWS). PIN MEASURES 1 3/8” X 1 3/4” AND IS MARKED EISENBERG ICE. 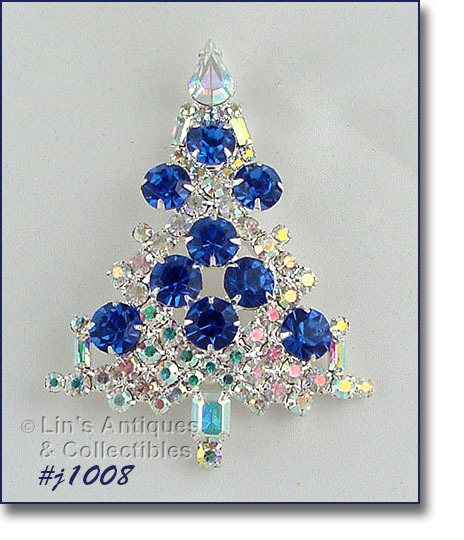 THIS EISENBERG ICE LISTING HAS A VERY PRETTY AND SOMEWHAT UNUSUAL CHRISTMAS TREE PIN! 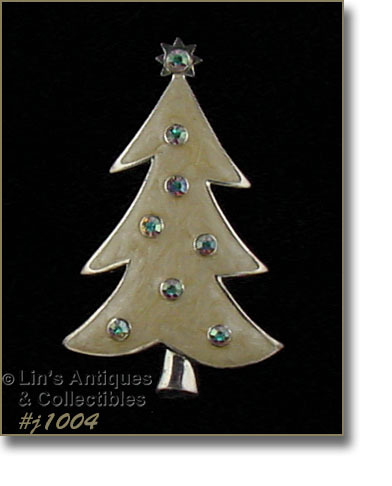 TREE IS SILVER-TONE WITH LIGHT BEIGE COLOR ENAMELING. THERE ARE AURORA BOREALIS RHINESTONES PLACED ON THE TREE AS “DECORATION” AND ONE IN THE CENTER OF THE TREE TOPPER. PIN MEASURES 2 1/2" X 1 5/8” AND IS MARKED EISENBERG ICE. 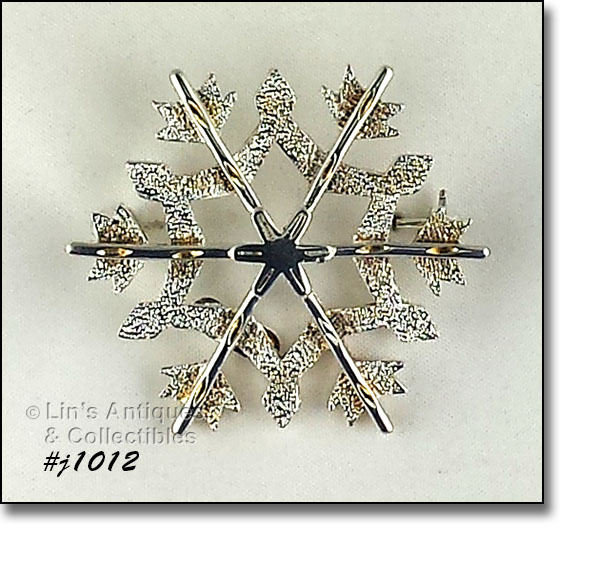 VERY PRETTY EISENBERG ICE SNOWFLAKE PIN IN THIS LISTING! PIN IS SILVER-TONE, ACCENTED WITH CLEAR RHINESTONES FOR A FLASH OF SPARKLE, MEASURES 2” DIAMETER, AND IS MARKED EISENBERG ICE. 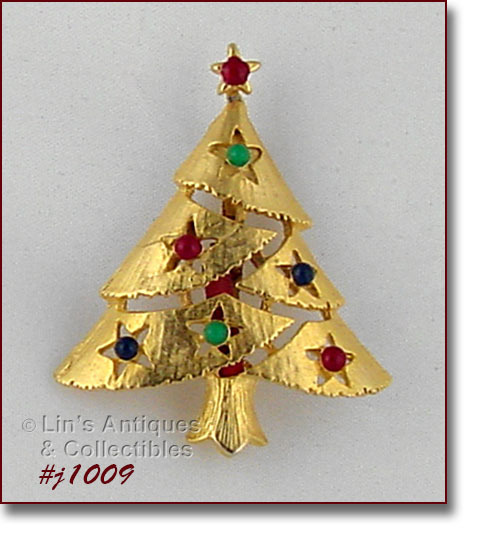 THIS IS A BEAUTIFUL EISENBERG ICE CHRISTMAS TREE PIN – IT IS GOLD-TONE WITH BOUGHS! PIN HAS GREEN RHINESTONE “CANDLES” THAT HAVE GOLD COLOR RHINESTONES AS FLAMES. IT MEASURES 2 1/2" X 1 3/4" AND IS MARKED EISENBERG ICE. 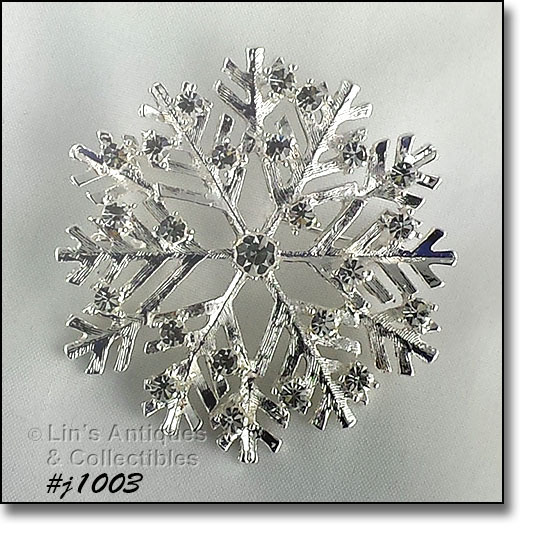 THIS EISENBERG ICE LISTING HAS A GORGEOUS SNOWFLAKE SHAPED PIN! IT’S SILVER-TONE AND COVERED WITH PRONG-SET, CLEAR, SPARKLY RHINESTONES. PIN MEASURES 1 3/4" X 1 1/2" AND IS MARKED EISENBERG ICE. 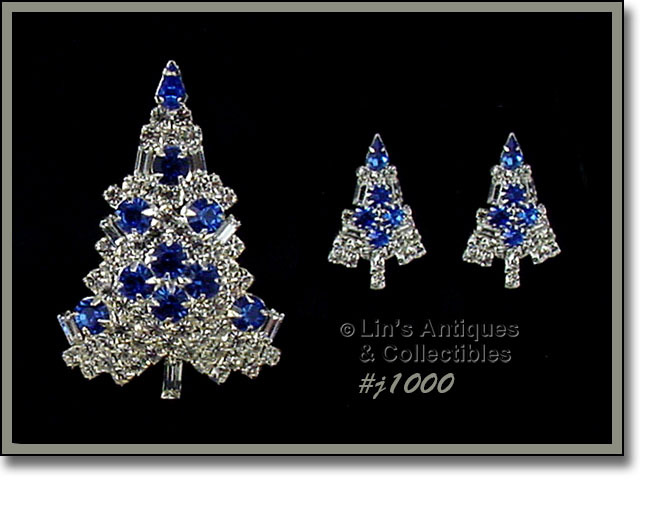 THIS EISENBERG ICE LISTING HAS A CLASSIC CANDLE TREE PIN BUT IN A SMALLER SIZE! PIN MEASURES 1 3/8” X 3/4" AND IS MARKED EISENBERG ICE. 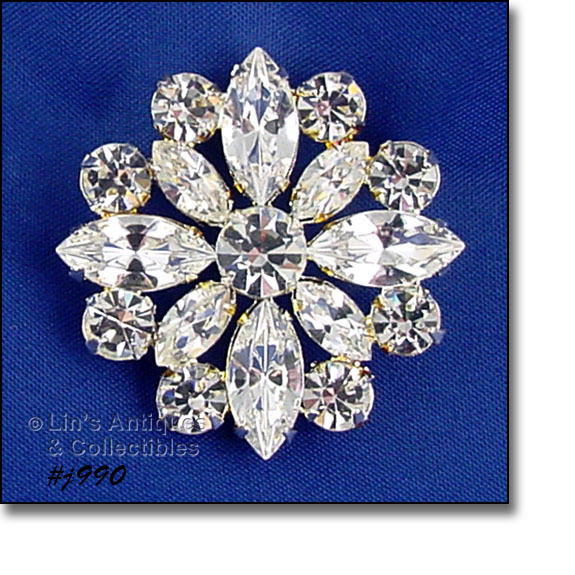 ABSOLUTELY BEAUTIFUL PIN WITH LOTS OF SPARKLE AND ALL RHINESTONES ARE PRONG-SET! BEAUTIFUL EISENBERG ICE ANGEL PIN! IT’S GOLD-TONE METAL WITH CLEAR PRONG-SET RHINESTONES. HER ROBE IS ATTACHED ONLY AT THE TOP PORTION SO IT HAS MOVEMENT. ANGEL MEASURES 2” LONG (AT LONGEST), 1 5/8” WIDE (AT WIDEST), AND IS MARKED EISENBERG ICE. 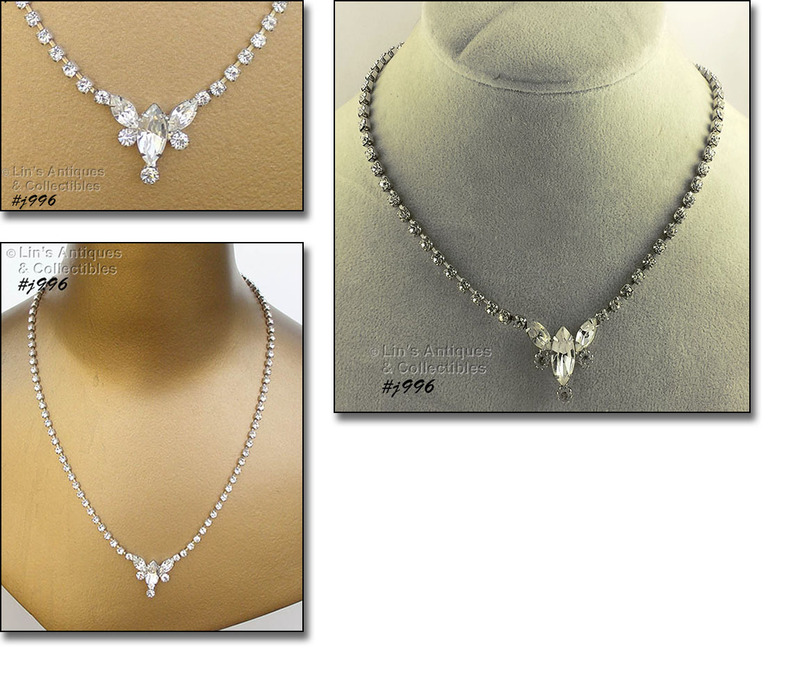 THIS LISTING HAS A BEAUTIFUL AND CLASSIC EISENBERG ICE NECKLACE! CLEAR, FACETED RHINESTONES HAVE LOTS OF SPARKLE AND EACH ONE IS PRONG SET. NECKLACE MEASURES 19 1/2" END TO END. GORGEOUS EISENBERG ICE CHRISTMAS TREE PIN! IT’S GOLD-TONE WITH GREEN ENAMELING AND IS “DECORATED” WITH 3 LARGE MARQUIS RHINESTONES AND ROUND FAUX PEARLS. PIN MEASURES 2 1/8” WIDE X 1 3/4" AND IS MARKED EISENBERG ICE. THIS LISTING HAS AN EXCELLENT CONDITION CLASSIC EISENBERG ICE CANDLE TREE PIN! IT IS A LITTLE DIFFERENT IN THAT THE RED RHINESTONE “DECORATIONS” ARE A LITTLE BRIGHTER RED THAN USUALLY FOUND ON THESE PINS. ALL RHINESTONES ARE PRONG-SET, PIN MEASURES 2 3/8” X 1 1/2”, AND IS MARKED EISENBERG ICE. THESE VINTAGE EISENBERG ICE EARRINGS ARE BEAUTIFUL! THEY’RE SILVER-TONE AND COVERED WITH SPARKLY CLEAR RHINESTONES. THE LARGER RHINESTONES ARE ROUND AND PRONG-SET; THE SMALLER ONES ARE PASTE SET. THEY MEASURE 1 1/4” X 1”, ARE CLIP BACK STYLE, AND MARKED EISENBERG ICE. CAMERA LIGHTING/REFLECTION SOMETIMES GIVES THE APPEARANCE OF YELLOWING AND/OR DISCOLORATION TO VERY SPARKLY RHINESTONES – THERE IS NO DISCOLORATION OR YELLOWING ON ANY OF THESE RHINESTONES (THEY ARE CLEAR AND VERY SPARKLY!). I LOVE EISENBERG’S PINWHEEL PINS! 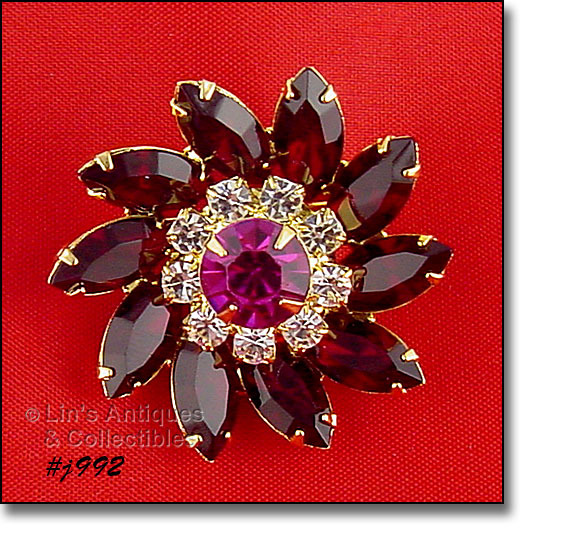 THIS ONE IS GOLD-TONE WITH RED MARQUIS SHAPED RHINESTONES, ROUND CLEAR RHINESTONES, AND A SINGLE LARGE ROUND PINK RHINESTONE IN THE CENTER. THIS LISTING HAS ONE OF EISENBERG’S LARGER PINS! 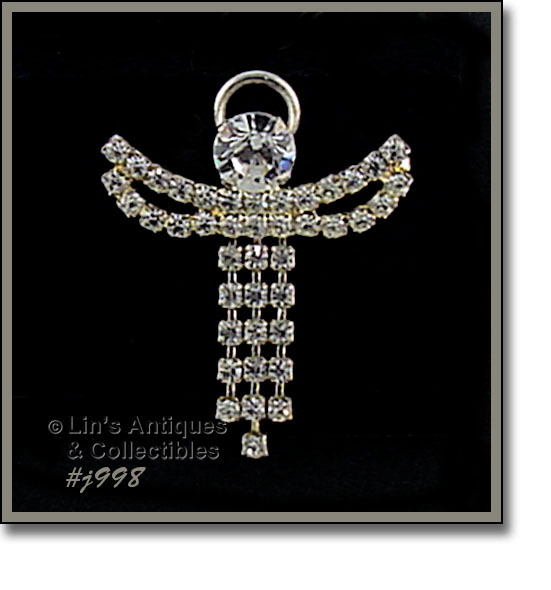 IT’S A MALTESE CROSS AND IS SILVER-TONE COVERED WITH CLEAR RHINESTONES. THIS ONE ALSO HAS SOME GOLD-TONE; MOSTLY BETWEEN THE RHINESTONES -- IF YOU LOOK CLOSELY AT THE PHOTO, YOU CAN SEE SOME GOLD-TONE COLOR. THE BACK (LARGE SURFACE) OF THE PIN IS SILVER-TONE. ABSOLUTELY BEAUTIFUL EISENBERG ICE PIN! THIS ONE IS ROUND SHAPE, SILVER-TONE, AND COVERED WITH ROUND AND MARQUIS RHINESTONES. ALL RHINESTONES ARE PRONG-SET. PIN MEASURES 1 1/2” DIAMETER AND IS MARKED EISENBERG ICE. BEAUTIFUL EISENBERG CHRISTMAS TREE SHAPED PIN! IT IS SILVER-TONE WITH MULTI-COLOR RHINESTONE DECORATIONS AND A CLEAR RHINESTONE TREE TOPPER. PIN MEASURES 2 1/4” LONG (AT LONGEST), 1 3/4” WIDE (AT WIDEST), AND IS MARKED EISENBERG ICE. I HAVE 2 AVAILABLE IN LISTING. 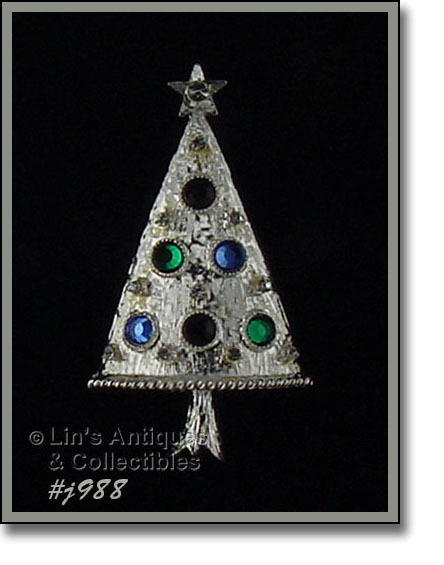 THIS LISTING HAS A GORGEOUS SILVER-TONE EISENBERG CHRISTMAS TREE PIN! IT HAS BLUE, RED, AND GREEN RHINESTONE “DECORATIONS” ALTERNATING WITH ROWS OF SMALL CLEAR RHINESTONES. PIN MEASURES 2 ½” LONG (AT LONGEST), 1 ½” WIDE (AT WIDEST), AND IS MARKED EISENBERG ICE. SEE OUR #j964 – IDENTICAL PIN EXCEPT IT IS GOLD-TONE! 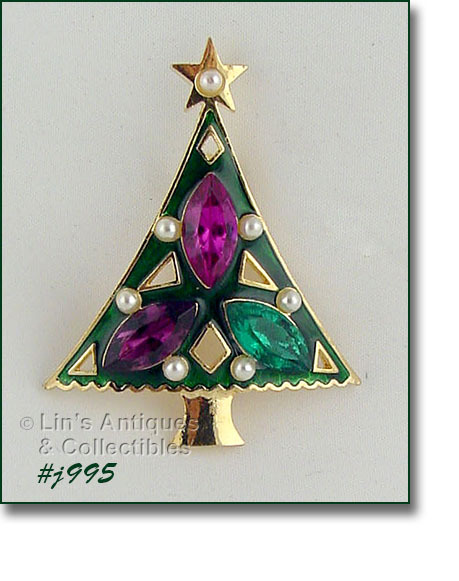 THIS IS A SMALLER SIZE EISENBERG CHRISTMAS TREE PIN THAT IS AN EYE-CATCHER! 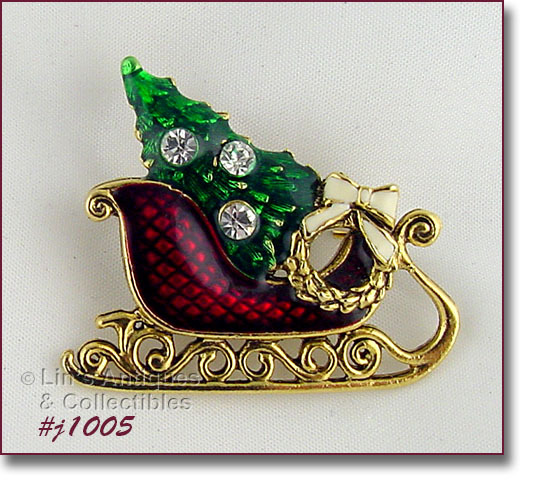 PIN IS GOLD-TONE WITH MULTI-COLOR RHINESTONES PLACES AS “ORNAMENTS”. IT HAS A GOLD COLOR RHINESTONE TREE TOPPER. PIN MEASURES 1 ¾” LONG (AT LONGEST), 1 3/8” WIDE (AT WIDEST), AND IS MARKED EISENBERG ICE. 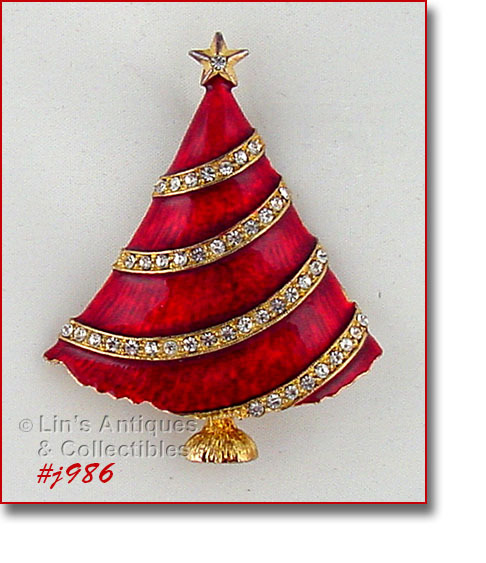 THIS EISENBERG ICE LISTING HAS A GORGEOUS CHRISTMAS TREE PIN! IT’S GOLD-TONE WITH RED ENAMELING AND CLEAR RHINESTONES PLACED ON TREE AS “GARLAND”. PIN MEASURES 2 5/16” LONG (AT LONGEST), 2” WIDE (AT WIDEST), AND IS MARKED EISENBERG ICE. 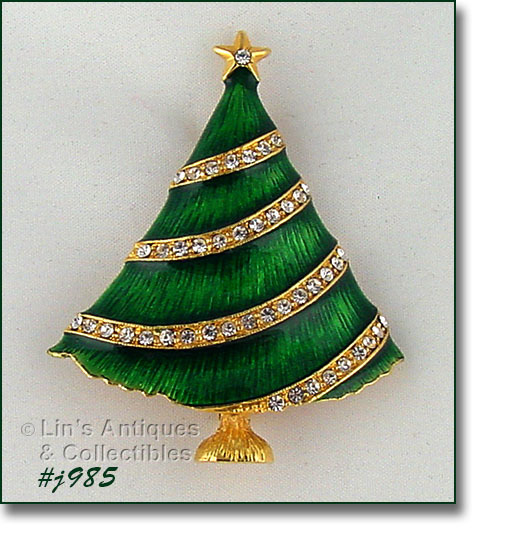 THIS EISENBERG ICE LISTING HAS A GORGEOUS CHRISTMAS TREE PIN! IT’S GOLD-TONE WITH GREEN ENAMELING AND CLEAR RHINESTONES PLACED ON TREE AS “GARLAND”. 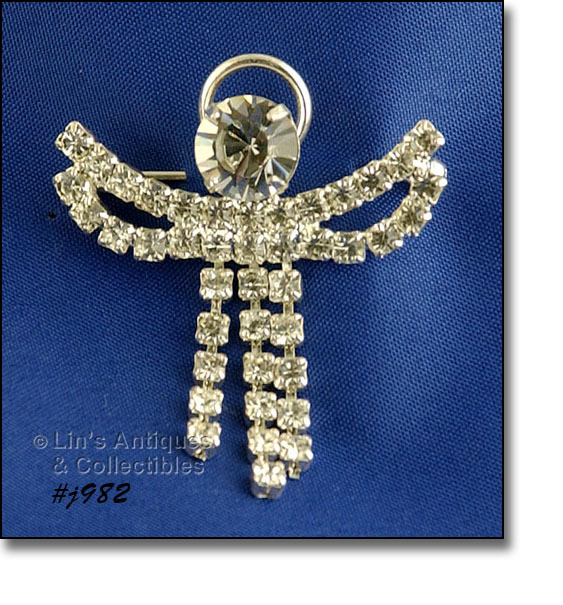 THIS LISTING HAS A LOVELY EISENBERG ICE PIN! 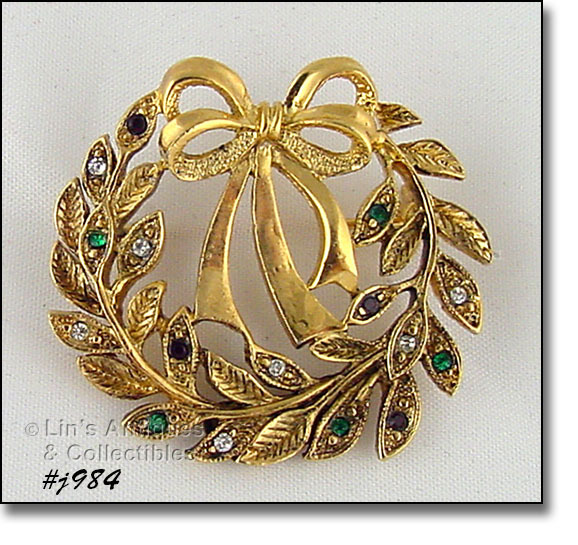 IT IS WREATH SHAPED AND IS GOLD-TONE METAL WITH RED, GREEN, AND CLEAR ACCENT RHINESTONES. PIN MEASURES 1 ½” DIAMETER AND IS MARKED EISENBERG ICE. BEAUTIFUL EISENBERG ICE ANGEL PIN! IT IS SILVER-TONE METAL WITH CLEAR PRONG-SET RHINESTONES. HER ROBE IS ATTACHED ONLY AT THE TOP PORTION SO IT HAS MOVEMENT.